Home > Why Math Rocks! The job offers arrived in plain envelopes. For decades, the mathematicians who accepted them stole off to Washington and the hush-hush National Security Agency, the nation's top techno-spy center. Through the cold war, NSA math whizzes matched wits with the Soviets: Each side protected its own secret codes while trying to break the other's. Math is more important than ever at the NSA. Chances are, the world's growing rivers of data contain terrorist secrets, and it's up to the agency's math teams to find them. But to land the best brains, the NSA must compete with free-spending Web giants such as Google () and Yahoo!. This is leading the agency to open up its recruiting process. "We have to look at new and innovative ways to find talent," says Cynthia Miller-Wentt, chief of the NSA's recruitment office. The agency is even co-sponsoring math and programming contests run by TopCoder, a Connecticut company whose matches attract geeks from all over the world. PATRIOT PITCH. There's a second hitch: Unlike the tech companies it must compete with, the NSA can hire only U.S. citizens. This is a severe constraint. About half of the estimated 20,000 math graduate students at U.S. universities are foreigners. They're off bounds, as are the bountiful math brains in India, China, Eastern Europe, and elsewhere. For now, NSA officials insist they're meeting recruiting targets. Half of all hires in the math division are PhDs, they report. (For security reasons, the NSA doesn't give numbers of the mathematicians and computer scientists working there.) But the officials admit that it's no easy job to lure a mathematician from a gold-plated job at a West Coast campus. The NSA's pitch? First the agency appeals to the recruits' patriotism. But there's also a lifestyle lure. NSA officials say a good number of mathematicians prefer a suburban Maryland life and a government job with predictable hours to the more frantic pace and market gyrations of an Internet company. This is especially true of women. In general, they're underrepresented in mathematics, but far less so at the NSA. "Many of our new hires are women, especially at the PhD level," says James Schatz, chief of the mathematics research group at the agency. UNWARRANTED DATA. Much of the work at the NSA boils down to the same challenges the Internet giants are grappling with. Like Yahoo, Google, and Microsoft, the NSA is working to squeeze intelligence out of the data flooding through global networks. "Look at the whole telecommunications industry, the information that's flying around the Internet," says Schatz. 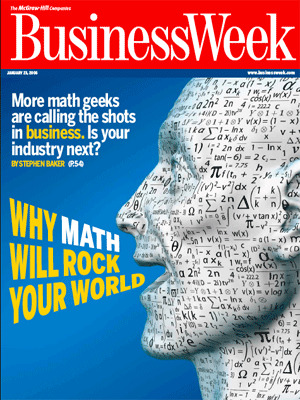 The study of these "massive data sets," he says, is "one area where mathematicians are having an enormous impact here." Indeed, NSA mathematicians are at the heart of the controversy percolating in Washington over wire taps President Bush authorized, without warrants, following the terrorist attacks of 2001. The President's policy casts a wider net for data -- from phone and Internet traffic -- giving NSA mathematicians more to work with. The mathematicians don't plow through the data alone. 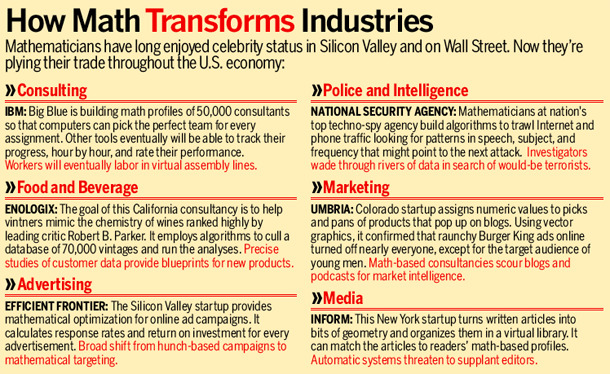 In the last decade, as the math problems have grown more complicated, the NSA has assembled multidisciplinary teams. They include mathematicians, engineers, and computer scientists, all working with intelligence agents. The agents, many of whom have backgrounds in liberal arts, focus the technical teams on the problems to solve. BRAND BUILDING. A big part of the recruiting challenge at the NSA is to attract young people who haven't heard of the agency. Its participation in the TopCoder contests is part of this drive. The agency is co-sponsoring a 10-week competition, starting Jan. 19, which is expected to attract thousands of computer scientists and math whizzes around the world. Through online elimination rounds, the field will be narrowed to 64. And this group, surrounded by large-display computer screens and cheering crowds, will compete together for $150,000 in prizes. TopCoder winners are often foreign, and therefore unavailable to the NSA. But the contest helps the agency build its brand as a cutting-edge lab for math and computer science. In the end, though, the success of the NSA -- and by extension, the national security of the U.S. -- hinges on the health of American math education. "If the U.S. mathematics community isn't healthy," Schatz says, "the NSA isn't healthy."